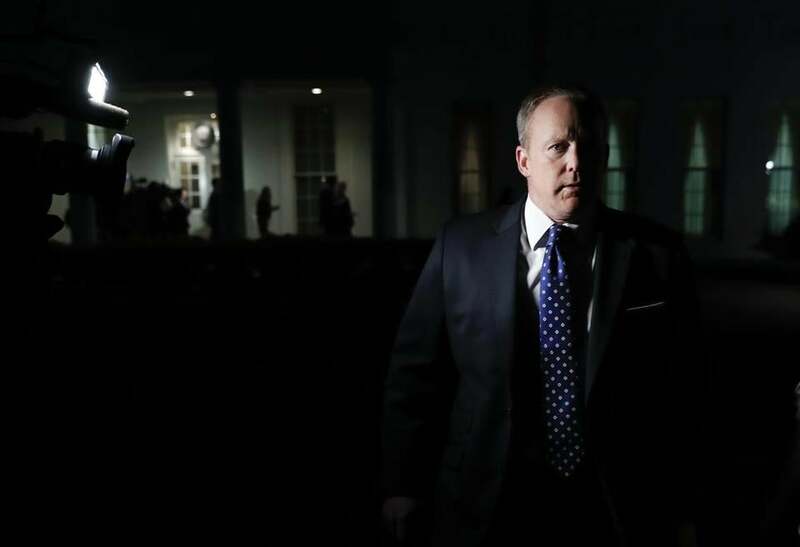 Thanks to a mix of combativeness with the press, awkward moments caught on camera, and a late-night TV doppelganger, Sean Spicer might have become as famous as his old boss. ►Inauguration crowd: Spicer set the tone for his tenure as the White House spokesman during his first press conference in January, after President Trump took office. Spicer took no questions and instead lambasted reporters with accusations of false reporting on the size of the crowds during the inauguration. He put forth a claim that has been repeated exhaustively by Trump since: that record numbers of people attended his inaugural. “This was the largest audience to witness an inauguration, period, both in person and around the world,” Spicer said. “These attempts to lessen the enthusiasm of the inauguration are shameful and wrong.” Factchecking after the fact proved Trump — and Spicer — wrong. ►Chemical weapons: Spicer was severely criticized in April after he made an awkward comparison between Adolf Hitler and Syrian leader Bashar Assad, saying Hitler did not gas his own people. Hitler did, in fact, use chemical weapons, Spicer said later, apologizing for the erroneous statements. ►Into the bushes: Trump had just fired former FBI director James Comey on May 9, and Spicer and his team were scrambling to explain the move to reporters. After wrapping up an on-camera interview with Fox Business on the White House grounds that evening, Spicer and members of his staff disappeared into the bushes for several minutes. An assistant to Spicer emerged first, telling a group of reporters he would answer questions so long as he was not filmed doing so. White House press secretary Sean Spicer walked from the West Wing of White House, in Washington, on , May 9, 2017, to speak to reporters. Carthy parodied Spicer on “Saturday Night Live” as a combative, abrasive figure who badgered and insulted reporters, drawing a water pistol and, later on, using a motorized version of the podium when taking questions. Trump reportedly hated the satirical portrait of his spokesman. Spicer thought McCarthy needed to slow down on the gum chewing. “Way too many pieces in there,” he said. ►Coaching from Gronk: Spicer, who is a huge New England Patriots fan, was working the day the team visited the White House to meet with Trump. During that day’s press conference, Spicer got an offer of help in dealing with the press from Patriots tight end Rob Gronkowski. “Need some help?” Gronkowski asked, ducking into the briefing. “I think I got this, but thank you,” Spicer replied. ►Easter bunny: Spicer’s oddest impression may have been made during his first turn in the White House, when he worked in the George W. Bush administration. That’s when the infamous photo of Spicer dressed as the White House Easter bunny was taken. It gained immortality, thanks to social media.